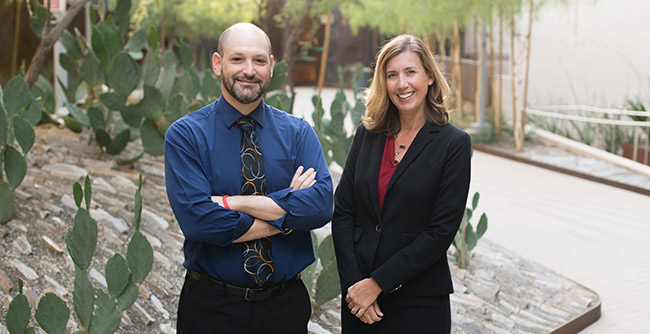 The University of Arizona College of Medicine – Phoenix is pleased to announce the launch of the reimagine Medicine Podcast. Each month, we will bring together clinicians, researchers, educators, health care thought leaders and medical students to share the experiences and ideas that are fueling their efforts. Gain insight from doctors who are doing extraordinary things in medicine and researchers who are developing breakthroughs that translate from bench to bedside. The reimagine Medicine podcast is currently available on iTunes, Google Play, Stitcher and Spotify. Jonathan Lifshitz, PhD, serves as the director of the Translational Neurotrauma Research Program, which is a joint venture through Barrow Neurological Institute at Phoenix Children’s Hospital, the Department of Child Health at the University of Arizona College of Medicine – Phoenix and the Phoenix Veterans Affairs Health Care System. College of Medicine – Phoenix, placing students with community clinical partners across the state. She is a family physician and the vice president of Primary Care Services at Bayless Integrated Healthcare. *The reimagine Medicine Podcast is narrated by C. Luke Peterson, DO. Dr. Peterson is a clinical assistant professor in the Department of Family, Community and Preventive Medicine and the associate program director of the Addiction Medicine Fellowship. Through evidence-based medicine approaches and process improvement, our partners at the Phoenix Veterans Affairs Health Care System are striving to improve the timeliness of health care delivery, early diagnosis and intervention, as well as disease prevention and healthy lifestyles. Learn more about the challenges they are experiencing — and the advancements they have made. Michelle Dorsey, MD, is the chief of radiology and clinical assistant professor in the Department of Radiology at the Phoenix Veterans Affairs Health Care System. Dr. Dorsey was selected as the first physician to represent the Department of Veterans Affairs as a White House Fellow with the White House Leadership Development Program. Clement Singarajah, MD, is an internist and leads the ICU division at the Phoenix Veterans Affairs Health Care System. He is a prominent leader in medical and resident education and has been positively impacting the training of future physicians in Arizona throughout his career. Colan Kennelly, MD, is a primary care physician at the Phoenix Veterans Affairs Health Care System. A graduate of the University of Arizona College of Medicine – Tucson, Dr. Kennelly helps prepare future physicians through his roles as lecturer and scholarly project mentor with the UA College of Medicine - Phoenix. The holiday season is not a time of joy and celebration for everyone. For many, preparing for the holidays brings elevated levels of stress, anxiety, loneliness and depression. This discussion centers on the philosophy that we teach our students, “If you do not first take care of yourself, then you will not be able to care for others.” This philosophy is applicable to anyone with responsibilities of caring for or guiding others, be they parents, physicians, patients, caregivers or leaders. Lizy Windsor is a clinical simulation nurse in the UA College of Medicine – Phoenix's Center for Simulation and Innovation. Lizy has 26 years experience working as a nurse in a clinical setting. She has a master's in Nursing Education and recently started her doctor of nursing practice program in Mental Health. She is also an active reservist in the US Air Force Reserve. Kristen Ray, DBH, LPC, is a licensed professional counselor and doctor of behavioral health. She serves as the vice president of Behavioral Health at Bayless Integrated Healthcare. Dr. Ray has extensive experience in integrated health care delivery, individual/family therapy, crisis intervention, program development and evaluation. Gina Touch-Mercer, PhD, is a clinical psychologist and an assistant professor in the Departments of Psychiatry and Family, Community and Preventive Medicine. She also serves as the director of the Behavioral Health and Social Sciences Theme, which is spread across the four-year MD curriculum to help students understand and heal the whole person. Medical devices and hospitals have been the targets of cyber attacks from hackers. The CyberMed Summit brings together the leading minds in cyber security to develop solutions to keep patients safe and medical technology secure. Dr. Christian Dameff is a founder of the CyberMed Summit, an emergency medicine physician and a researcher. A University of Arizona College of Medicine – Phoenix Class of 2014 graduate, Dr. Dameff is board-certified in Emergency Medicine and is currently a Clinical Informatics fellow at the University of California, San Diego. Dr. Jeff Tully is also a founder of the CyberMed Summit, a pediatric physician and a security researcher. Dr. Tully is a graduate from the University of Arizona College of Medicine – Phoenix Class of 2014. He is board-certified in Pediatrics and is currently an Anesthesiology resident at the University of California, Davis Medical Center. Dr. Suzanne Schwartz serves as the associate director for science and strategic partnerships with the Center for Devices and Radiologic Health at the US Food and Drug Administration. Patrick O’Connor is a third-year medical student with the UA College of Medicine – Phoenix. He has attended both CyberMed Summits and is currently working on a project with Dr. Christian Dameff and Dr. Jeff Tully.